Calling all TABASCO lovers! You know nothing enhances your food better than a few dabs of Louisiana's famous red pepper sauce, and now you can enjoy its unique flavor in high-quality Jelly Belly Jelly Beans. 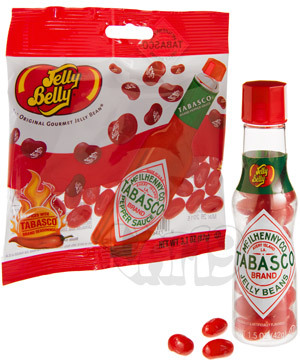 Jelly Belly TABASCO Jelly Beans are spiced with genuine TABASCO seasonings for a deliciously hot candy treat. Currently available in two sizes: 1.5oz bottle and 3.1oz bag. 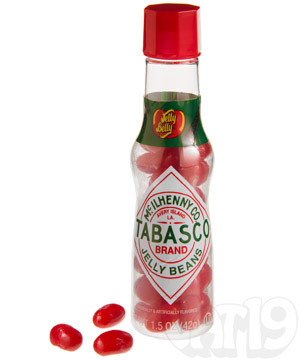 Please note: Jelly Belly does not allow us to ship this item outside the U.S.
TABASCO® Candy? Yes! They're TABASCO® jelly beans! It's fascinating to think that two iconic companies, McIlhenny and Jelly Belly, were both founded nearly 150 years ago, and it has taken nearly 150 years for them to join forces! Introducing TABASCO® Jelly Belly Jelly Beans! These chewy delights taste exactly like the original red pepper sauce known for its combination of red pepper, salt, and distilled vinegar. 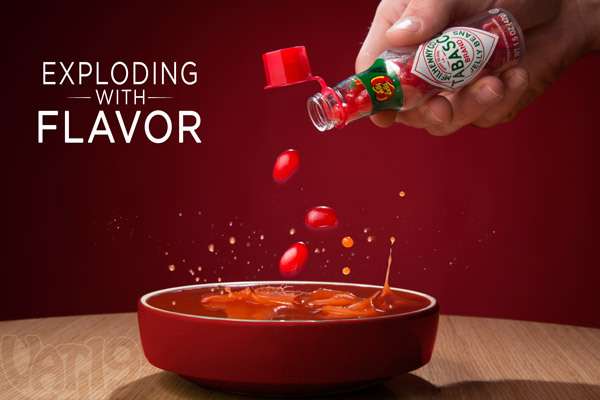 Jelly Belly and TABASCO® teamed up to create the sauciest (pun intended!) candy around. Jelly Belly is known around the world for its uncanny ability to harness real-life flavors into a jelly bean-sized capsule. So, it should come as no surprise that their TABASCO®-flavored Jelly Beans taste exactly like the renowned red pepper sauce. Jelly Belly is known for delivering spot-on taste. 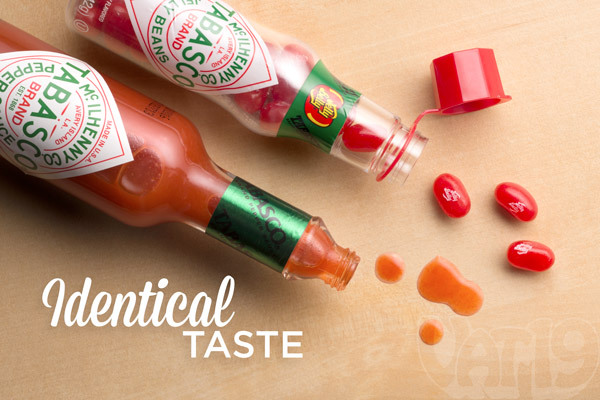 Their TABASCO® jelly beans are nearly indistinguishable from the real pepper sauce. Yum! 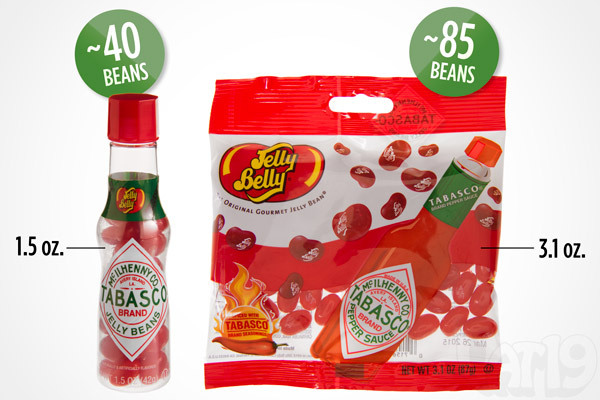 TABASCO® Jelly Belly Jelly Beans are available in two styles of packaging: bottle and bag. The bottle is reminiscent of the classic TABASCO® Pepper Sauce bottle whereas the bag is all about bang for your buck. The 1.5oz bottle contains approximately 40 beans and the 3.1oz bag holds about 80-85 beans. Jelly Belly TABASCO Jelly Beans are available in two sizes: 1.5oz bottle and 3.1 oz bag. 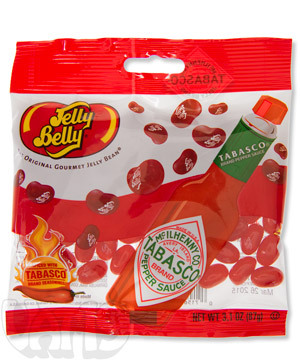 Question: If I like TABASCO®, will I like these jelly beans? Question: I'm not sure I'd like my candy to taste like TABASCO®. Is it good? Answer: We know where you're coming from since we had the same concerns with our Bacon Lollipops, but just like those delicious lollies, the TABASCO® Jelly Belly Jelly Beans simply "work". You shan't be disappointed! Question: Can I put them on my eggs? Answer: Once you buy them (hint, hint), you can do just about anything you want with them. We say go for it! Answer: Sugar, Corn Syrup, Modified Food Starch, Contains 2% or Less of the Following: TABASCO® Brand Pepper Paste (distilled vinegar, red pepper, salt), Vinegar, Artificial Flavor, Color Added, Red 40 Lake, Sodium Diacetate, Maltodextrin, Salt, Beeswax, Carnauba Wax, Confectioner's Glaze. Question: Would these be a perfect addition to my Jelly Belly Bean Machine? Answer: Why that was certainly a fortuitous question! Absolutely! The bean machine dispenses any and all flavors of Jelly Belly Jelly Beans!